Biomaterials research in Wang Lab focused on the development of novel cohesive colloidal gels as an injectable cranial defect filler for controlled release osteogenesis. Dr. Wang used biodegradable PLGA nanoparticles to create a novel bone filler as an alternative to the invasive surgery often required to repair skeletal defects . Furthermore, this bone filler can be used as drug delivery carrier for locally controlled release system for accelerating bone healing . Dr. Wang was the first to elucidate the mechanisms of the biomaterial and found that this colloid gel self-assembled through electrostatic forces, which resulted in a stable 3-D network that may be extruded or molded to the desired shape and can fill irregular tissue defects [3, 4]. Dr. Wang discovered that the injectability of this PLGA colloidal gel was determined by the solid concentration of the gel, the size, and the surface charge of nanoparticles . Furthermore, Dr. Wang found the drug released from the gels following zero-order kinetics occurred for more than two months . This is a substantial advancement in nanoparticle drug release systems research because most systems previously studied only released drugs for a few weeks. Dr. Wang’s biodegradable colloidal gels are providing a viable approach for targeted drug delivery and tissue repair. Immediately after the publication of original work in Advanced Materials and Biomaterials, several following research have begun to study this colloidal system and published papers in peer-reviewed journals [5, 6]. 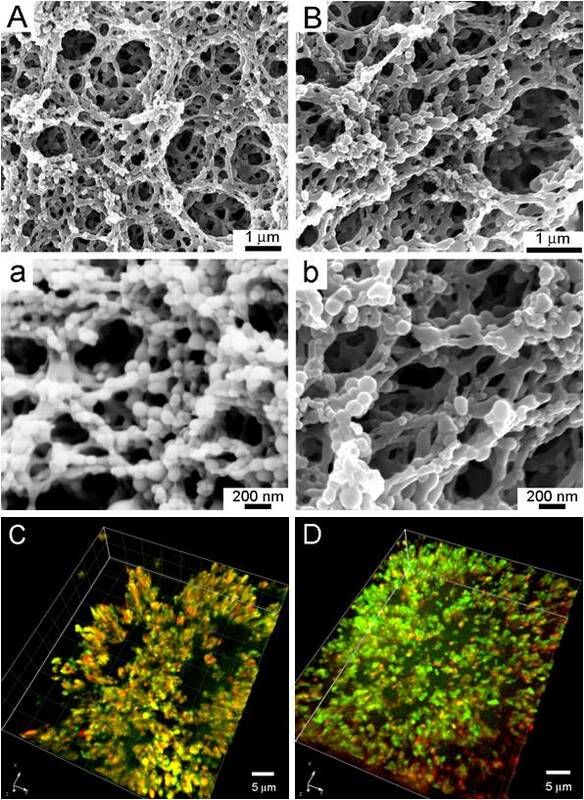 SEM and Laser Scanning Confocal Micrographs observation of colloidal gels revealed similar porous microstructure and nanostructure . 1) Wang Q, Wang L, Detamore MS, Berkland C. Biodegradable colloidal gels as moldable tissue engineering scaffolds. Advanced Materials. 2007; 20(2):236-239.